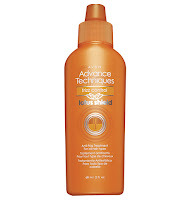 Avon Advance Techniques Frizz Control Lotus Shield. You know those qualities you'd kill for in a DIY blow dry - super-straight strands, megawatt shine, zero frizz? A drop of this supplies them all. 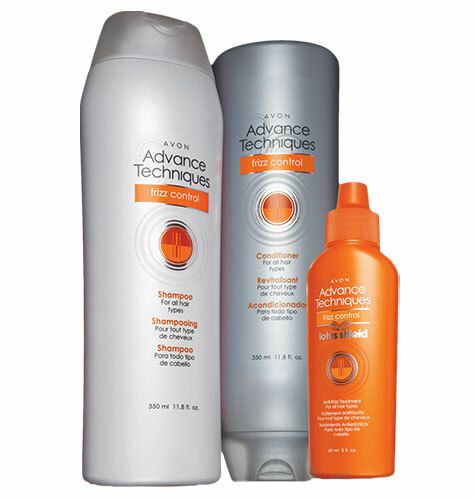 Say good-bye to frizz, flyaways & hair that is untamed. One application, and frizz is finished. Like a lotus leaf repels water, our breakthrough lotus-inspired technology defies up to 97% humidity. Keeps hair smooth and well-behaved for 3 days. Bad weather is no longer the enemy. Leave-in treatment forms a lightweight barrier that helps block out humidity to fight frizz without weighing hair down. Apply to damp hair. Dry & style as normal. For all hair types. 2 fl. oz. Complete your routine for maximum results with Frizz Control Shampoo & Conditioner. Product #918-734 and 922-308 SALE $4.99/ea.